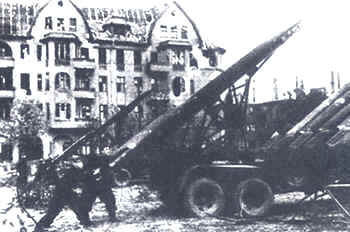 World War Two was the first war to see the concerted use of rockets – be they rockets fired at civilians such as the V1 and V2, rockets fired from planes at trains etc as was seen so clearly in the early days after D-Dayin June 1944 and rocket systems such as the Katyusha used to support the infantry by the Russians in their advance to Berlin. Developments in planes and tanks, for example, had occurred in the 1930’s. The same cannot generally be said for rockets. It was World War Two that gave the stimulus for rocket development, which culminated in the V2 and post-World War Two, the intercontinental ballistic missile (ICBM) of the Cold War. The father of the rocket in modern times was considered to be the Russian Tsiolkovsky. As early as 1903, he had developed the theoretical formula of a rocket powered by liquid oxygen and liquid hydrogen. InAmerica, Robert Goddard also experimented with rockets and in the 1920’s several of his inventions flew to a height of several hundred feet. When Goddard died in 1945, the government and the military had largely ignored his work. It was only in 1959, that Congress posthumously honoured him. Piecemeal rocket development was carried out in several nations pre-war but the governments of each nation invariably ignored what was being done. It was World War Two that gave the boost to rocket development, so that by 1945, the V2 had been launched and rockets were here to stay – both for military and for space development. The countries most associated with rocket development were Germany, America, Great Britain and Japan.